Our cities are "smart" and getting smarter as information processing capability is embedded throughout more and more of our urban infrastructure. Few of us object to traffic light control systems that respond to the ebbs and flows of city traffic; but we might be taken aback when discount coupons for our favorite espresso drink are beamed to our mobile phones as we walk past a Starbucks. Sentient City explores the experience of living in a city that can remember, correlate, and anticipate. Five teams of architects, artists, and technologists imagine a variety of future interactions that take place as computing leaves the desktop and spills out onto the sidewalks, streets, and public spaces of the city. "Too Smart City" employs city furniture as enforcers: a bench ejects a sitter who sits too long, a sign displays the latest legal codes and warns passersby against transgression, and a trashcan throws back the wrong kind of trash. "Amphibious Architecture" uses underwater sensors and lights to create a human-fish-environment feedback loop; "Natural Fuse" uses a network of "electronically assisted" plants to encourage energy conservation; "Trash Track" follows smart-tagged garbage on its journey through the city’s waste-management system; and "Breakout" uses wireless technology and portable infrastructure to make the entire city a collaborative workplace. These projects are described, documented, and illustrated by 100 images, most in color. 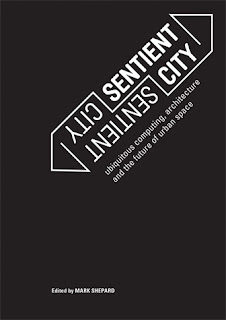 Essays by prominent thinkers put the idea of the sentient city in theoretical context. Copublication with the Architectural League of New York. Sentient City will also feature a special "heat sensitive" cover which will change color when exposed to sunlight or touch! The Editor Mark Shepard is Assistant Professor of Architecture and Media Study at the University at Buffalo, State University of New York, and an editor of the Situated Technologies pamphlet series, published by the Architecture League of New York. Los proyectos que aparecen en el libro son muy interesantes. Estaría bien proponer algún taller para realizar algunos proyectos con el CELAB.